During Black Friday I picked up a bunch of things I wanted from Sugarpill (not all of them because the husband would flip if had bought the remaining 11 items I don't own! ), I bought quite a few things but I still have more on my list! I love Sugarpill and cannot say enough good things about them, their products, and their wonderful customer service! I will have swatches up soon along with a review of the things I bought. Do you own any Sugarpill stuff? What's your favorite(s)? Ooh, I'm jealous! 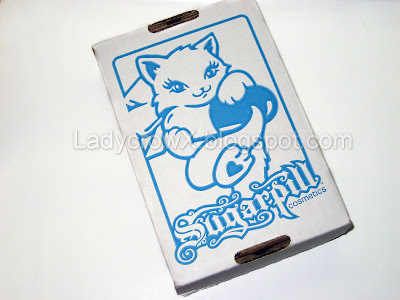 I want more Sugarpill so bad but I haven't gotten any since last Christmas because of my unemployment. I have Tiara, Stella, Birthday Girl, Tipsy, and Royal Sugar. I *love* Tipsy and Royal Sugar, they're my favorite green and blue, respectively. I want the rest of the loose shadows for my everyday collection and the pressed shadow palettes for travel. Yes! I have both palettes plus eight of the loose eyeshadows. I can't decide which one I like best! I already have all of the pressed shadows, but I picked up 3 loose shadows during the sale. I'm really liking the Royal Sugar and Asylum!